Top 10 Alfalfa Benefits - Wonderful Herb! Top 10 Alfalfa Benefits – Wonderful Herb! Beyond being the name of an adorable little rascal, alfalfa is actually a hugely underestimated nutritional resource. Primarily used as a source of food for cattle, this sprouting pea relative can yield a wealth of positive effects. Alfalfa benefits are plentiful, but we’ve put together a list of the top 10 alfalfa benefits for you to peruse. It might make you think twice before rejecting the goodness of alfalfa sprouts nutrition on your submarine sandwich, or shunning alfalfa tea benefits over your standard Earl Grey! Cholesterol control: It’s possible, based on some studies that one of the benefits of alfalfa may be to lower cholesterol, primarily “bad” cholesterol. Arthritis Assassin: While insufficient information exists, it has been suggested that alfalfa may ease the symptoms of arthritis. Tummy Troubles: It’s not scientifically proven, but, alfalfa benefits purportedly include alleviating an upset stomach. Bladder Blights: Perhaps attributable to its supposed ability to increase urine flow, alfalfa is thought to aid the bladder. 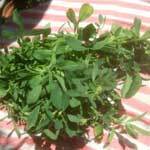 Asthma Assistance: There is no evidence to support the theory, however, alfalfa is thought to help control the symptoms associated with asthma. Valuable Vitamin: Looking to get B vitamins, along with A, C, E and K? Need a little calcium or potassium? Then perhaps this perennial or an alfalfa supplement is right for you! Fluid Retention Fixer: Possibly associated with its kidney benefits, one unproven attribute of alfalfa is its ability to reduce the retention of fluid. Whoop that Whooping Cough: The Chinese were thought to have used alfalfa benefits to relieve whooping cough. Kidney Stones SWAT Team: Because of its high vitamin content (A, C and E) which are thought to help dissolve kidney stones, alfalfa may be practical for use in this application. Hair Loss Helper: Carrot and lettuce juice, combined with the beneficial juice of alfalfa is thought to possibly correct and stave off hair loss. The leaves of alfalfa, as shown above, can be beneficial in many ways. However, avoid alfalfa side effects that result from consumption of the seeds. While alfalfa seeds nutrition may seem tempting, stick to the leaves and sprouts of this flowering plant.